Welcome to the Insecure Writer’s Support Group Website. 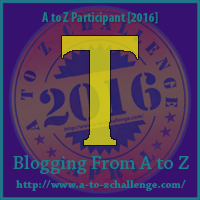 Our A to Z Challenge theme: Writing Resources. Podcasts are a great way of learning more about the craft, particularly while on the go. They also keep you up-to-date with industry news, often in an entertaining way. The trouble is finding the good ones. This link leads to ten great ones, and included is a helpful snippet about each so you can find the ones you like best. If you enjoy listening to podcasts, which ones are your favorites? On the go is sometimes easier indeed. I've only listened to a couple - should listen to more. I've heard good things about listening to podcasts. I'll check this out. Blog hopping from North Carolina during the #Challenge. Deciding to start with bloggers WAY dow the list figuring they wouldn’t get as many visits. I can see I must rethink this blog. I am not an insecure writer, don't like excuses, but need to give this another try this year. I was delighted to find your T post today. Thank you. Inviting you to TEA today-part of my theme of hotels and inns this year. Hope you have time and interest. So cool. I will have to check them out. I just posted a post before my last post, about podcasts I like listening to, so now maybe, I have some more to add to the list. My picks were different from this list in that they were all the Indie life. Thanks for the link. Not really interested in pod casts, but maybe i should change that. ? Ten very kewl podcasts! Thanks, Lynda! I haven't listened to any podcasts. Will give it a try sometime. I am just now getting into podcasts. The one I listen to most is a fantasy-improv show. I'm starting to listen to Black Girl Nerds, too. I'd love to listen to some on writing.